Architecturally, the original house is known as Plantation Plain, a simple regional style common in the Piedmont South from the late eighteenth century to the 1870's which developed from the Central-Passage and earlier Hall-and-Parlor Style houses. Generally, Plantation Plain was a two-over-two room design with a gable roof and a chimney at each end. 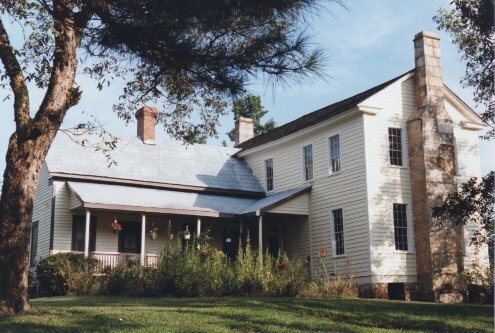 The existing 1812 portion of the house is the two story front section and consists of two rooms over two rooms with wide central halls containing a half-turn stairway with two landings. It is constructed of heart pine and the beams are joined by mortise and tenon construction secured with wooden pegs. Chimneys at the gable ends of the house provide each room with a fireplace. A separate log kitchen building was removed in the 1860's when the Sims Family, who owned the property at that time, added the rear portion of the house. The back wing was the three-room living quarters for the caretaker until February 2004 when it was converted to support space. The main portion of the house may be toured by appointment or when scheduled. Listen to longtime caretaker Amos Hutchins talk about the house and grounds. The front porch, a variation from the Plantation Plain style, is one of the most interesting features of the Winn House. Circa 1918 when the home was greatly remodeled by the Sims family, the porch was changed to four solid pine columns, cut from trees on the Winn plantation, rested on a deep porch and reached two stories high to support a flat room. Within this large porch which extended almost across the entire front of the house was a shorter and narrower porch at the second story level. This "swinging porch", as it was referred to by its occupants, was actually stationary. It was suspended from the underside of the porch roof and, like the larger porch, was pegged to the side of the house. Opening onto this "swinging porch" from the upstairs hall is a door, framed by a glass transom and sidelights similar to the front door below. In 1945, the "swinging porch" was removed, and the pine columns were cut in half to support a smaller one-story version of the original porch, also called a one-story shed configuration. The Winn House chimney to the front right bears two dates. They are difficult to read. The 1811 date may place the year of beginning construction of the original 2-story structure. The year 1812 has generally been used as the completed construction date by the Historical Society. The 1864 date probably places the year of completion of the single-story addition. There are several differences in these two areas of the house. Stone piers support the 1812 section, and brick piers support the 1864 section. The 1812 windows are smaller with smaller panes of glass than those in the 1864 addition. The chimneys are of stone in 1812 and of brick in 1864. Wood shingles roof the 1812 wing while those on the 1864 section are of tin. Differences in the cornices, moldings, and trim are also evident. The front entrance of the house is simple with a glass overhead transom and sidelights halfway down from the top of the door framing the door. It opens into the center hall where the stairs lead to the second floor hall. On each side of the two halls is a room about 17 feet square with a stone fireplace. The simple window openings are carefully balanced with two end windows, two front windows, and two rear windows in most rooms. There is a door rather than two rear windows in the downstairs dining room, and only one rear window in the downstairs parlor. The craftsmanship and good quality of materials in the house are notable. The house, which is weather boarded with heart pinewood, rests on hand-hewn sills held together with pegs. The rooms are sealed with 10- to 11-inch wide, tongue-in-groove pine boards that still fit together snugly. The interior pine doors have four panels, all held in place with wooden pegs. The two chimneys are built of massive stones probably quarried by John B. Hill, a quarryman and rock mason, who lived near Hog Mountain. Mr. Hill operated a quarry on the old Auburn Road near the Appalachee Creek. These huge rocks have been carefully cut to specification and laid in a definite pattern. The rock ridge or cap around the top of the chimney was a trademark of Mr. Hill's work. Although the Winn house is simple in design, special treatments were applied to the interior woodwork in an attempt to give the house a finer look. The plain pine of the Interior woodwork was transformed into mahogany doors and burled walnut and stone mantels under the skillful paintbrush of an itinerant painter. During the period when the Winns occupied the house, it was probably furnished in a mixture of styles with Piedmont Plain being predominant. Piedmont Plain is a regional style of furniture made by local craftsmen. It was functional furniture built in good proportions with quality wood. Samples of several types of furniture are displayed in the house today. The Plain-style of furniture, also called neat pieces, is generally simple pieces without ornamentation or elaboration. Little carving was used. Where inlay was used it was usually geometric and spare. Painted furniture was usually in monochrome earthy colors: brick red, brown, dark blue, green, black, or ochre. Grained pieces were also in earthy colors. If inlay was simulated on a grained piece, it too was simple. Verticality is a frequent quality in these pieces. Many sideboards, tables, desks, and bedposts are taller than their Northern counterparts, possibly to better fit the high-ceilinged rooms of nineteenth-century Georgia. Many pieces have long legs, probably to elevate the case or tabletop to allow free air circulation. Much of the furniture is idiosyncratic. No two huntboards exactly alike may be found. The furniture was designed to fit the houses and to work for the people who used it. Samples of several types of this style furniture are displayed in the house today. Armoire - This circa 1800s piece was donated by Rick Jones. Cherry Sideboard - This piece is in the Piedmont Plain design of the mid 1800s and given by Philadelphia Winn Maltbie to her daughter, Marie M. Terrell. It was donated from the Terrell House by Larry Mabrey. Cornish Organ - This piece was made by the Cornish Company in Washington, New Jersey, and was used at Olney Primitive Baptist Church in Oak Park, Georgia, in the mid-1920s. Charles and Doris Stone donated it in May 2000 in honor of her father, S. M. Findley. Winn Sofa - Donated in 1984 by Alice Winn Peeples Strickland, great-great-granddaughter of Elisha Winn and Judith Cochran; great-granddaughter of Richard Dickinson Winn and Charlott Mitchell; granddaughter of Tyler Macon Peeples and Alice Winn Peeples. The sofa was inherited from her mother, Sue Burton Wellington Graham Peeples, the widow of Richard Winn Peeples. Richard Winn Peeples practiced law in Lawrenceville and was mayor in the 1890s. He was the first Historian of Gwinnett County. The sofa was re-covered in a cordovan colored fabric in 2003 through the generosity of Stephen P. Strickland, the son of Alice Winn Peeples Strickland. He remembers the sofa in the living room of their home in Alabama from early childhood. Acorn Bed - This mid-1800s piece with feather mattress is named after the design of the acorn on the top of the bed post. It is a gift of Larry Mabrey. Chest of Drawers - This piece was made about 1840 in the Piedmont Plain design in Gwinnett County and was owned by Mrs. Lanier (born 1824 - married 1840). She passed the piece on to her granddaughter, Mrs. Freeman. The original had glass pull knobs. Blanket Chest - This circa 1840 piece is also in the Piedmont Plain design from Elbert County, Georgia. Dressing Screen - This item was a gift of Larry Mabrey. Cradle - This item was made in 1917 by Henry Thomas Garner for his son, Thomas Sylvester. It was donated by Phyllis Garner Davis. Pitcher - The pitcher with a flower design was donated by Grace B. Puckett in memory of her mother, Mary Jane Burel. Rope Bed - This piece is from White County, Georgia, circa mid-1800s. It uses a straw mattress. A rope bed key is used to tighten the ropes, hence the term, "Sleep tight." The item is on permanent loan from John Christopher. Cradle - This piece is from the early 1800s and is a gift of Carolyn Robison. Spinning Wheel - This mid-1800s piece is from Gwinnett County and is a gift of Robert Tedder. Sampler Quilt & Frame - This is on loan from Susan R. Frazier. Weasel or Clock Reel - On loan from Jean Todd. Early 1800s.